Type 2 diabetes mellitus (T2DM), a metabolic disorder, is a major global health-care problem., The World Health Organization has predicted that the global prevalence of diabetes will increase from 2.8% in 2000 to 4.4% in 2030. A main function of Vitamin D is to regulate calcium and phosphorus homeostasis and bone metabolism. Vitamin D may influence several nonskeletal medical conditions, including cardiovascular disease, cancer, autoimmune disorders, psoriasis, multiple sclerosis, and T2DM.,, It has been reported that there is an inverse relationship between circulating levels of Vitamin D and the prevalence of T2DM. In fact, Vitamin D deficiency has being suggested as a risk factor for T2DM., Some studies have shown that Vitamin D may play a functional role on glucose tolerance through its effects on insulin secretion and insulin sensitivity. Moreover, Vitamin D seems to affect glucose homeostasis and found to be inversely related to glycated hemoglobin (HbA1c) levels in gestational diabetes mellitus. In diabetes, oxidative stress is caused by both an increased formation of plasma-free radicals and a reduction in antioxidant defenses. Hyperinsulinemia and hyperglycemia may enhance the production of free radicals and induce oxidative stress. There is considerable evidence that the oxidative stress plays a key role in insulin resistance, impaired insulin secretion, and many of the complications of diabetes such as micro-/macro-vascular damage., Superoxide dismutase (SOD) and glutathione peroxidase (GPx) are antioxidant enzymes that protect the body against active oxygen-free radicals., Some experimental studies showed that Vitamin D may have antioxidant properties by modifying some of the antioxidant enzymes., Therefore, the aim of this study was to investigate the levels of 25-hydroxy Vitamin D (25[OH]D) in patients with T2DM and in nondiabetic healthy controls and to ascertain the impact of 25(OH)D levels on glycemic control and oxidative stress in T2DM patients. This is a case–control study including thirty cases. Inclusion criteria were all cases diagnosed as male patients with T2DM, aged 36–53 years, attending the outpatient clinics of Kasr El Ainy Hospital, Cairo University. Twenty healthy males of comparable age and socioeconomic status served as a control group. The study was conducted in October 2014. Exclusion criteria included use of drugs which affect calcium and bone metabolism, chronic disorders of liver and kidney, cancer, endocrinology disorders such as hypo-or hyper-thyroidism and hyperparathyroidism, insulin injection, use of anticonvulsion drugs, Vitamin D, and calcium supplementation. A written informed consent of participation in the study was taken from all participants. This study was approved by the Committee of Ethics and Research of the university hospital. Weight and height were measured, and the body mass index (BMI) was calculated by dividing body weight by squared height (kg/m 2). Venous blood samples were drawn in a fasting state from all the participants. Blood samples were left to clot at room temperature and centrifuged, and the serum was separated and stored at −20°C until further analysis. SOD activity was determined using the method of Sun et al. GPx activity was measured by the method of Paglia and Valentine. The results were expressed as mean ± standard error. The statistical difference between groups was analyzed using Student's t-test. Pearson's correlation analysis was performed to determine the relationships between variables. The results were considered significant at P < 0.05. The statistical calculations were done using Statistical Package for the Social Sciences version 15 software, while the presentations were performed using Microsoft Excel 2007. Serum Vitamin D levels were significantly lower in patients with T2DM than healthy controls (P = 0.015) [Figure 1]. Patients with T2DM had higher BMI as well as FBS and PP than healthy controls (P = 0.012, P = 0.000, and P = 0.000, respectively) [Table 1]. There was a significantly lower GPx activity in patients with T2DM as compared with those of healthy controls (P = 0.048), but the difference in SOD activity did not reach statistical significance [Table 1]. [Table 2] illustrates the correlation between different studied parameters in patients with T2DM. There was a significant negative correlation between serum Vitamin D levels and HbA1c (P = 0.016), and also there was a negative correlation between serum Vitamin D levels and PP (P = 0.018), but no statistical correlation was shown between serum Vitamin D levels and FBS, GPx, and SOD. In addition, GPx and SOD had no statistical correlation with HbA1c. T2DM is a progressive disease characterized by insulin resistance and β-cell dysfunction that ultimately leads to altered insulin secretion. The pathogenesis of T2DM is multifactorial. Environmental factors play an important role either as triggers or even have protective role., One among the environmental factors which may play a role in T2DM pathogenesis is Vitamin D deficiency. Vitamin D plays a wide range of functions in our body such as regulation of mineral homeostasis, bone remodeling, and also plays a role in immune system. Apart from these well-known functions, many studies have shown that Vitamin D also plays an important role in β-cell function, insulin sensitivity, and secretion by both direct and indirect actions. In T2DM, the role of Vitamin D was suggested from the presence of Vitamin D receptors (VDR) on the pancreatic β-islet cells. In these cells, the biologically active metabolite of Vitamin D (i.e., 1,25-dihydroxy Vitamin D [1,25(OH)2D]) enhances insulin production and secretion via its action on the VDR. Several studies demonstrated a relationship between single-nucleotide polymorphisms in the genes regulating VDR and Vitamin D binding protein and glucose intolerance and insulin secretion.,, This further supports a role for Vitamin D in T2DM and may explain the reduced overall risk of the disease in subjects who ingest >800 IU/day of Vitamin D. However, an alternative, perhaps related, explanation was proposed for the role of Vitamin D in the prevention of T2DM based on its potent immunomodulatory functions. 1,25(OH)2D modulates the production of the immunostimulatory interleukin (IL)-12 and the immunosuppressive IL-10, and VDRs are present in most types of immune cells. Vitamin D protect β-cells against cytokine-induced apoptosis. In our study, Vitamin D levels were found to be negatively correlated with HbA1c levels. This was in agreement with other studies., HbA1c is considered an indicator of average blood glucose concentrations during the preceding 2–3 months and thus a long-term marker of glucose homeostasis. There was a negative correlation between Vitamin D levels and PP, but no correlation between fasting glycemia and 25(OH)D was found, although that, Vitamin D levels being related to glycemic control where HbA1c reflects glucose control over time and it is more accurate than FBS and PP. We found a nonsignificant difference in SOD activity in patients with T2DM when compared to controls. SOD is considered to be the first line of defense against oxidation stress; it protects the body against active oxygen-free radicals by scavenging excess superoxide to form hydrogen peroxide which is then converted to water by GPx enzyme. Our results revealed that GPx activity was significantly low in patients with T2DM, indicating decreased scavenging capacity of glutathione-dependent antioxidant defense system against elevated lipid peroxidation processes in these patients. There was no significant correlation between serum levels of 25(OH)D and activities of GPx and SOD enzymes in patients with T2DM in our study. It was suggested that in the early stage of T2DM, the antioxidant defense system counters the effects of increased free radicals, so it was supposed that the antioxidant enzymes activities increased as a compensatory response to oxidative stress, but by the advanced stage, the balance between generation of free radicals and antioxidant defense is impaired as a result of decreased antioxidant activities due to their possible depletion. There is a considerable body of evidence indicating that hyperglycemia may interfere with natural defense of the antioxidant system, in addition to increasing the production of free radicals. Since SOD enzyme is part of the first line of defense against free radicals, it is expected that the activity of this enzyme may be affected by oxidative stress before the other antioxidant enzymes. Taheri et al. 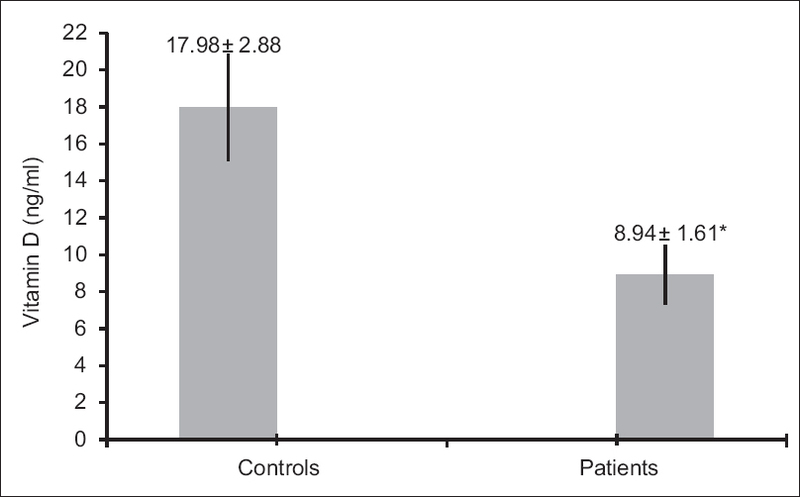 indicated that SOD activity was lower in patients with diabetes compared with healthy controls. There is evidence to show that hyperglycemia is accompanied by the loss of Cu 2+, which is an essential cofactor in SOD activity, and SOD is inactivated by glycosylation in erythrocytes. As hyperglycemia, a hallmark of diabetic condition, depletes natural antioxidants and facilitates the production of reactive oxygen species (ROS) through glucose autoxidation and nonenzymatic glycation of proteins, and as Vitamin D levels were related to glycemic control in patients with T2DM as indicated in our study, Vitamin D supplementation can improve oxidative stress in patients with diabetes by improving glucose control. Several studies on experimental models showed that Vitamin D has antioxidant properties.,,, Wiseman  reported that Vitamin D3 can inhibit lipid peroxidation induced by iron in brain liposome; therefore, Vitamin D could serve as cellular membrane antioxidant. Anticancer activity of Vitamin D is also attributable to its antioxidant property. Mukhopadhyay et al. also conducted a study in murine lymphoma and concluded that the anticancer effect of Vitamin D3 is mainly through its antioxidant potential. Vitamin D can be considered as a casual antioxidant which scavenges ROS in the first stage before activation of other stress-sensitive response pathways; on the other hand, Vitamin E or other antioxidants may be considered a more “symptomatic” rather than a causal treatment for oxidative stress because these antioxidants scavenge the already formed oxidants. This study showed that Vitamin D levels appear to be lower in patients with T2DM than in the control group and Vitamin D levels were related to glycemic control in T2DM. The study had some limitations; the sample size was small and the sunlight exposure of each individual varies on a daily basis. Low level of Vitamin D might play a significant role in T2DM pathogenesis and this finding may have therapeutic implications as cautious Vitamin D supplementation may improve glycemic control and oxidative stress in T2DM. MSE contributed in the conception and design of the work, coordinated and carried out all experiments, performed statistical analysis, participated in manuscript preparation, revised the draft, approval of the final version of the manuscript, and agreed for all aspects of the work. IMI contributed in the conception of the work, collected samples from patients, provided assistance for all experiments, revised the draft, approval of the final version of the manuscript, and agreed for all aspects of the work. MMA contributed in the conception and design of the work, prepared the manuscript and revised the draft, approval of the final version of the manuscript, and agreed for all aspects of the work. Haghdoost AA, Rezazadeh-Kermani M, Sadghirad B, Baradaran HR. Prevalence of type 2 diabetes in the Islamic Republic of Iran: Systematic review and meta-analysis. East Mediterr Health J 2009;15:591-9. Heaney RP. Functional indices of Vitamin D status and ramifications of Vitamin D deficiency. Am J Clin Nutr 2004;80 6 Suppl: 1706S-9S. Holick MF. High prevalence of Vitamin D inadequacy and implications for health. Mayo Clin Proc 2006;81:353-73. Jolfaie NR, Rouhani MH, Onvani S, Azadbakht L. The association between Vitamin D and health outcomes in women: A review on the related evidence. J Res Med Sci 2016;21:76. Lim S, Kim MJ, Choi SH, Shin CS, Park KS, Jang HC, et al. Association of Vitamin D deficiency with incidence of type 2 diabetes in high-risk Asian subjects. Am J Clin Nutr 2013;97:524-30. Palomer X, González-Clemente JM, Blanco-Vaca F, Mauricio D. Role of Vitamin D in the pathogenesis of type 2 diabetes mellitus. Diabetes Obes Metab 2008;10:185-97. Lau SL, Gunton JE, Athayde NP, Byth K, Cheung NW. Serum 25-hydroxyvitamin D and glycated haemoglobin levels in women with gestational diabetes mellitus. Med J Aust 2011;194:334-7. Ceriello A. Oxidative stress and glycemic regulation. Metabolism 2000;49 2 Suppl 1:27-9. Rahimi R, Nikfar S, Larijani B, Abdollahi M. A review on the role of antioxidants in the management of diabetes and its complications. Biomed Pharmacother 2005;59:365-73. Muth CM, Glenz Y, Klaus M, Radermacher P, Speit G, Leverve X. Influence of an orally effective SOD on hyperbaric oxygen-related cell damage. Free Radic Res 2004;38:927-32. Bhabak KP, Mugesh G. Functional mimics of glutathione peroxidase: Bioinspired synthetic antioxidants. Acc Chem Res 2010;43:1408-19. Karmakar R, Banik S, Chatterjee M. Inhibitory effect of Vitamin D3 on 3'methyl-4-dimethyl-amino-azobenzene-induced rat hepatocarcinogenesis: A study on antioxidant defense enzymes. J Exp Ther Oncol 2002;2:193-9. Mukhopadhyay S, Singh M, Chatterjee M. Vitamin D3 as a modulator of cellular antioxidant defence in murine lymphoma. Nutr Res 2000;20:91-102. Angermayr L, Melchart D, Linde K. Multifactorial lifestyle interventions in the primary and secondary prevention of cardiovascular disease and type 2 diabetes mellitus – A systematic review of randomized controlled trials. Ann Behav Med 2010;40:49-64. Taylor AV, Wise PH. Vitamin D replacement in Asians with diabetes may increase insulin resistance. Postgrad Med J 1998;74:365-6. Harinarayan CV. Vitamin D and diabetes mellitus. Hormones (Athens) 2014;13:163-81. Gagnon C, Lu ZX, Magliano DJ, Dunstan DW, Shaw JE, Zimmet PZ, et al. Serum 25-hydroxyvitamin D, calcium intake, and risk of type 2 diabetes after 5 years: Results from a national, population-based prospective study (the Australian Diabetes, Obesity and Lifestyle study). Diabetes Care 2011;34:1133-8. Taheri E, Saedisomeolia A, Djalali M, Qorbani M, Madani Civi M. The relationship between serum 25-hydroxy Vitamin D concentration and obesity in type 2 diabetic patients and healthy subjects. J Diabetes Metab Disord 2012;11:16. Bayani MA, Akbari R, Banasaz B, Saeedi F. Status of Vitamin-D in diabetic patients. Caspian J Intern Med 2014;5:40-2. Need AG, O'Loughlin PD, Horowitz M, Nordin BE. Relationship between fasting serum glucose, age, body mass index and serum 25 hydroxyvitamin D in postmenopausal women. Clin Endocrinol (Oxf) 2005;62:738-41. Kos E, Liszek MJ, Emanuele MA, Durazo-Arvizu R, Camacho P. Effect of metformin therapy on Vitamin D and Vitamin B12 levels in patients with type 2 diabetes mellitus. Endocr Pract 2012;18:179-84. Payne JF, Ray R, Watson DG, Delille C, Rimler E, Cleveland J, et al. Vitamin D insufficiency in diabetic retinopathy. Endocr Pract 2012;18:185-93. Holick MF. Diabetes and the Vitamin D connection. Curr Diab Rep 2008;8:393-8. Szathmary EJ. The effect of Gc genotype on fasting insulin level in Dogrib Indians. Hum Genet 1987;75:368-72. Hirai M, Suzuki S, Hinokio Y, Hirai A, Chiba M, Akai H, et al. Variations in Vitamin D-binding protein (group-specific component protein) are associated with fasting plasma insulin levels in Japanese with normal glucose tolerance. J Clin Endocrinol Metab 2000;85:1951-3. Baier LJ, Dobberfuhl AM, Pratley RE, Hanson RL, Bogardus C. Variations in the Vitamin D-binding protein (Gc locus) are associated with oral glucose tolerance in nondiabetic Pima Indians. J Clin Endocrinol Metab 1998;83:2993-6. Cantorna MT, Zhu Y, Froicu M, Wittke A. Vitamin D status, 1,25-dihydroxyvitamin D3, and the immune system. Am J Clin Nutr 2004;80 6 Suppl: 1717S-20S. Veldman CM, Cantorna MT, DeLuca HF. Expression of 1,25-dihydroxyvitamin D(3) receptor in the immune system. Arch Biochem Biophys 2000;374:334-8. Riachy R, Vandewalle B, Kerr Conte J, Moerman E, Sacchetti P, Lukowiak B, et al.1,25-dihydroxyvitamin D3 protects RINm5F and human islet cells against cytokine-induced apoptosis: Implication of the antiapoptotic protein A20. Endocrinology 2002;143:4809-19. Cimbek A, Gürsoy G, Kılıç Z, Acar Y, Demirbaş B, Bayram M, et al. Serum 25 hydroxy Vitamin D3 levels in type 2 diabetic patients. Med BullHaseki 2013;51:89-94. Kostoglou-Athanassiou I, Athanassiou P, Gkountouvas A, Kaldrymides P. Vitamin D and glycemic control in diabetes mellitus type 2. Ther Adv Endocrinol Metab 2013;4:122-8. Woerle HJ, Pimenta WP, Meyer C, Gosmanov NR, Szoke E, Szombathy T, et al. Diagnostic and therapeutic implications of relationships between fasting, 2-hour postchallenge plasma glucose and hemoglobin a1c values. Arch Intern Med 2004;164:1627-32. Saedisomeolia A, Taheri E, Djalali M, Djazayeri A, Qorbani M, Rajab A, et al. Vitamin D status and its association with antioxidant profiles in diabetic patients: A cross-sectional study in Iran. Indian J Med Sci 2013;67:29-37. Hisalkar PJ, Patne AB, Fawade MM, Karnik AC. Evaluation of plasma superoxide dismutase and glutathione peroxidase in type 2 diabetic patients. Biol Med 2012;4:65-72. Singhania N, Puri D, Madhu SV, Sharma SB. Assessment of oxidative stress and endothelial dysfunction in Asian Indians with type 2 diabetes mellitus with and without macroangiopathy. QJM 2008;101:449-55. Sailaja YR, Baskar R, Saralakumari D. The antioxidant status during maturation of reticulocytes to erythrocytes in type 2 diabetics. Free Radic Biol Med 2003;35:133-9. Taheri E, Djalali M, Saedisomeolia A, Moghadam AM, Djazayeri A, Qorbani M. The relationship between the activates of antioxidant enzymes in red blood cells and body mass index in Iranian type 2 diabetes and healthy subjects. J Diabetes Metab Disord 2012;11:3. Karasu C. Glycoxidative stress and cardiovascular complications in experimentally-induced diabetes: Effects of antioxidant treatment. Open Cardiovasc Med J 2010;4:240-56. Hamden K, Carreau S, Jamoussi K, Miladi S, Lajmi S, Aloulou D, et al.1Alpha, 25 dihydroxyvitamin D3: Therapeutic and preventive effects against oxidative stress, hepatic, pancreatic and renal injury in alloxan-induced diabetes in rats. J Nutr Sci Vitaminol (Tokyo) 2009;55:215-22. Cetinkalp S, Delen Y, Karadeniz M, Yüce G, Yilmaz C. The effect of 1alpha, 25(OH)2D3 vitamin over oxidative stress and biochemical parameters in rats where type 1 diabetes is formed by streptozotocin. J Diabetes Complications 2009;23:401-8. Wiseman H. Vitamin D is a membrane antioxidant. Ability to inhibit iron-dependent lipid peroxidation in liposomes compared to cholesterol, ergosterol and tamoxifen and relevance to anticancer action. FEBS Lett 1993;326:285-8. Deeb KK, Trump DL, Johnson CS. Vitamin D signalling pathways in cancer: Potential for anticancer therapeutics. Nat Rev Cancer 2007;7:684-700. Ceriello A. New insights on oxidative stress and diabetic complications may lead to a “causal” antioxidant therapy. Diabetes Care 2003;26:1589-96.